After serving as pastor for eleven years at the Ebenezer German Congregational Church, a dispute caused Reverend John H. Hopp and a group from the Ebenezer Church to leave the congregation. Together they organized the Zion German Congregational Church on April 13, 1914 at the home of Brother Conrad Helzer. Both churches were part of the Congregational Conference of Oregon. 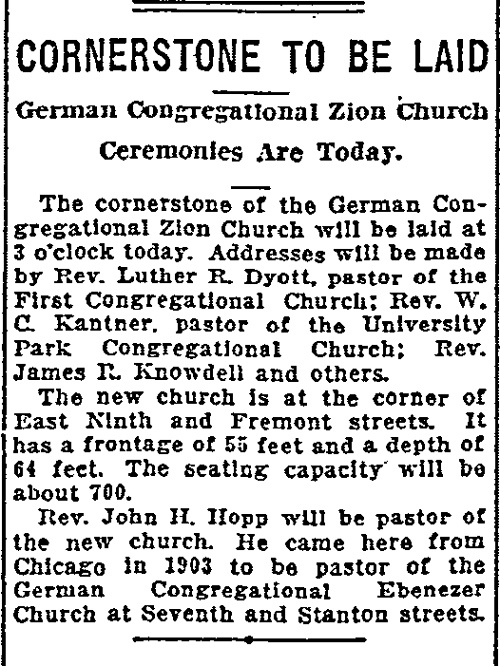 Dedication of the Zion German Congregational Church on November 8, 1914. Courtesy of Marie Trupp Krieger. The first officers were: John H. Krieger, Chairman; Henry Schwartz, Secretary; John Weber, Treasurer; George Hinkle, John Hohnstein, William Lind, and Ludwig Sauer, Trustees; Conrad Repp, Peter Schnell and George Weitz, Deacons; Christina Herder, Organist. Many of these families had emigrated from the Volga German colony of Norka, Russia. 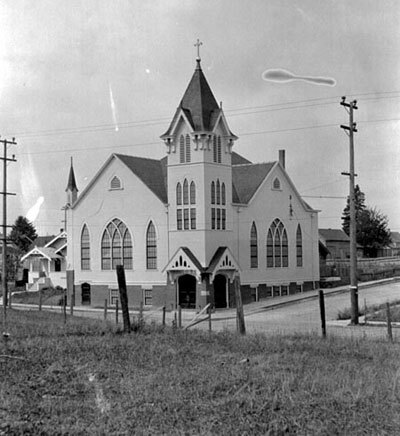 The members of the Zion Church purchased the site at NE 9th and Fremont and immediately began to build a new structure. 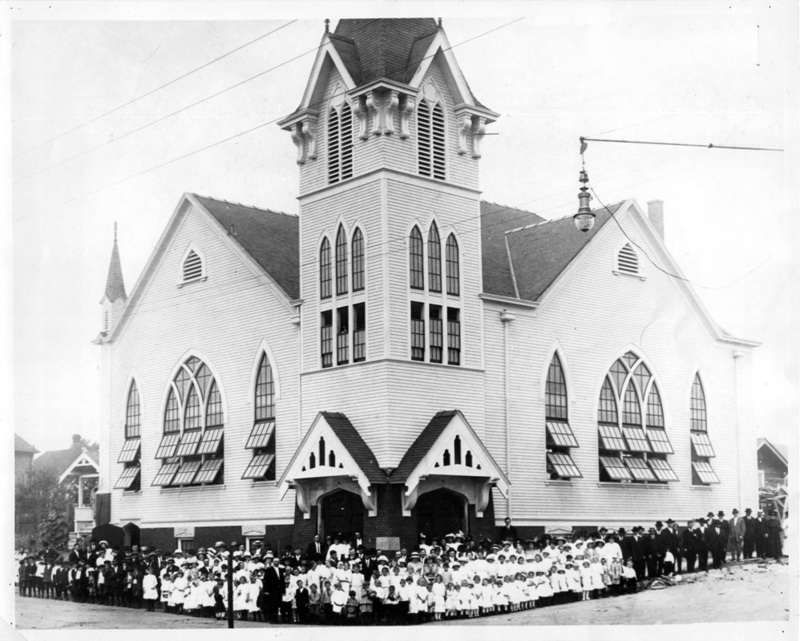 While the church building was being constructed, the congregation worshiped at the First United Mennonite Baptist Church on NE 6th and Fremont. The cornerstone for the new church was laid on July 19, 1914. From that day on, the worship services were held in the basement of the new building until the remainder of the structure was completed. The total cost of the church amounted to $20,000, which included the furnishings. The article above was published in "The Sunday Oregonian" on July 19, 1914 (page 15). The cornerstone of Zion German Congregational Church. The German inscription translates to "Built in 1914 A.D." Courtesy of Steve Schreiber. The building was completed on November 8, 1914 and was dedicated that day. The parsonage next to the church was built in the same year at a cost of $1,579. A beautiful tone bell, which called the people to worship for many years, was purchased and installed in the tower in April 1915. The Zion Church has had another year or splendid success. All the departments have been remarkably active in their respective fields. The Ladies Aid Society has a membership of eighty-two and is active financially, and all the other organizations deserve equal mention. The Sunday School is very well officered and well attended. The attendance at the church services and prayer meetings has been steadily increasing. The revival meetings in January were very successful. Eighty-five were converted. New life and new spirit were created in the church. Hoping that the coming year will hold a degree of prosperity and growth for our church, we take courage. In 1914, church clerk John Weber reported that 180 members were admitted (90 males, 90 females and 90 families). Our church is getting along nicely. We have increased greatly in membership, especially during the last revival. We are on a solid foundation. The Zion German Congregational Church circa 1920. The photograph was taken from what is now Irving Park looking northwest across NE Fremont.. Courtesy of Gottfried Schreiber. On the tenth anniversary of the church in 1924 there were 290 members and over 300 Sunday school pupils. New immigrants continued to arrive from both the old country and the Midwest settling in the Northeast Portland enclave. As a result, the congregation continued to progress and grow in membership. In 1929, a beautiful pipe organ was purchased and installed at a cost of a little over $3,300. The church was known as Zion Brethren Congregational Church in 1925, perhaps reflecting the desire to downplay the German heritage after World War I, and recognizing the importance of the Brethren who played such an important role in the church. Reverend Hopp served the Portland's Volga German community for 22 years, retiring in 1936. Zion was commonly known as 'Hopp’s Church' in tribute to its founding pastor. Reverend Otto Tiede accepted the call to Zion Congregational Church on August 3, 1936. Shortly after his arrival he organized Sunday school classes and a short time later classrooms were installed which were a great help to the teachers. In the early days of the church all of the classes met in the basement, each class assigned to a separate bench. The teachers stood between the benches, each trying to speak louder than his neighboring teacher, their only teaching aid being the German Bible and Christian Faith. Reverend George J. Schmidt began his pastorate with Zion on July 11, 1938 and enjoyed a ministry of over two years before Reverend Kalmbach took leadership of the church November, 4, 1940. Reverend Paul Kalmbach led the church during the difficult World War II years sharing with the members their heartaches and sorrows as well as prayers answered and dreams fulfilled. Reverend Kalmbach was born on October 24, 1897 in Krasnodor (Caucasus), Russia and immigrated alone to America during the Russian Revolution at age 16. He graduated from the theological seminary in Yankton, South Dakota then known as the Redfield Academy and did his post graduate work at York College, Nebraska. Reverend Kalmbach was State President of the Congregational Conferences in Oregon and California. Many improvements to the church were made at this time including new pulpit chairs and a brass railing for the platform. Brother Borgardt donated a beautiful Baptismal Fount and Brother Brauer started a fundraising campaign which resulted in the purchase of a grand piano. Reverend Theodore Strobel arrived at Zion on January 1, 1947. In 1952, the question of whether German or English should be used in church services was a matter of great concern to the church membership. Many of the younger people lost interest in the church because of their inability to read and understand the German language which was used a most services. Some younger people left the church and the Albina neighborhood to seek English speaking churches and new areas to live. A compromise was made and the younger people were allowed to buy the English Hymnals; this made it possible for young and old alike to worship in the language best understood. The language problem was not resolved in Reverend Strobel’s pastorate but would diminish by the early 1960’s as English became the primary language used in church services. At the same time the language issue emerged, the need was felt for an organization of young married couples. The Fellowship Club was the result of this need and this group became one of the most active organizations in the church. Reverend Strobel also organized a Junior Choir in 1947. Reverend Strobel also served as the pastor of a church in Lodi, California. Reverend Strobel’s first wife died and he remarried. Reverend Strobel and his second wife died within hours of each other. Reverend Emanuel Geier accepted a call to the Zion church in 1952 and coordinated the activity for its 40th Anniversary celebration. During this time, a building fund was created toward a goal of a much need educational and social annex. Tower chimes were donated by Ross Hollywood Chapel and installed. Reverend Kenneth Biel arrived in August 1954 and brought new people and energy to the church. He was an active and dynamic leader, constantly seeking new ideas for the betterment of the church. During his pastorate, Zion hosted two Pacific Conferences in 1956 and 1961. Reverend Biel was vitally interested in the youth of the church and the community. He reorganized and directed the Junior Choir. Under his leadership a daily vacation Bible school was organized as well as retreats to Camp Adams. In 1955, the congregation purchased a very fine parsonage several blocks from the church. This purchase allowed the former parsonage to be used as a church annex. In March of 1958, the name of the church was officially changed from Zion German Congregational Church to Zion Congregational Church of Portland, Oregon. A short time later the church changed from German to English services, and new English hymnals were purchased. This brought new life to the younger generation. On December 2, 1960, the congregation voted to approve the Constitution of the United Church of Christ and become officially affiliated with that body. Rev. Raymond Schatz served the congregation beginning in October 1962. In December of 1966, the German Congregational Evangelical Brethren Church (the "Brethren church") and Zion church voted and approved a merger of the two congregations. In April 1967, a consolidation plan for the merger was adopted and the Zion parsonage was sold. The formal merger with the Brethren church occurred on June 29, 1967. The first service of the newly merged congregation was held in July 1967 at the Zion church building. The 155 members of the Brethren church joined the Zion church, with its 265 members, to become the Zion Brethren Church of the United Church of Christ. The newly merged congregation continued to meet at the Zion church building until a new facility could be built. The farewell service for the Brethren church building was held on August 6, 1967 and it was sold in October of that year for $35,000. Six years after the merger, under the leadership of Reverend Robert C. Klein, the congregation relocated to a new $180,000 structure on 3.5 acres at 3201 NE 148th Street and changed the name to Rivercrest Community Church. The Zion church building was sold. In 1986, the former Zion church building was owned by the Mt. Zion Baptist Church, with Percy N. Manuel, Sr. as President. In 2009, the Gresham Baptist Church purchased the property on NE 9th and Fremont and began renovations to the church building. Greater Gresham formed a partnership with Door of Hope, a church that was seeking to establish a ministry in inner northeast Portland. The Door of Hope completed renovations of the building and started worship services in 2014.